EPUB is one of the most widespread ebook formats which is supported by the vast majority of ebook readers. Needless to say, these files won’t be opened without special software preinstalled. 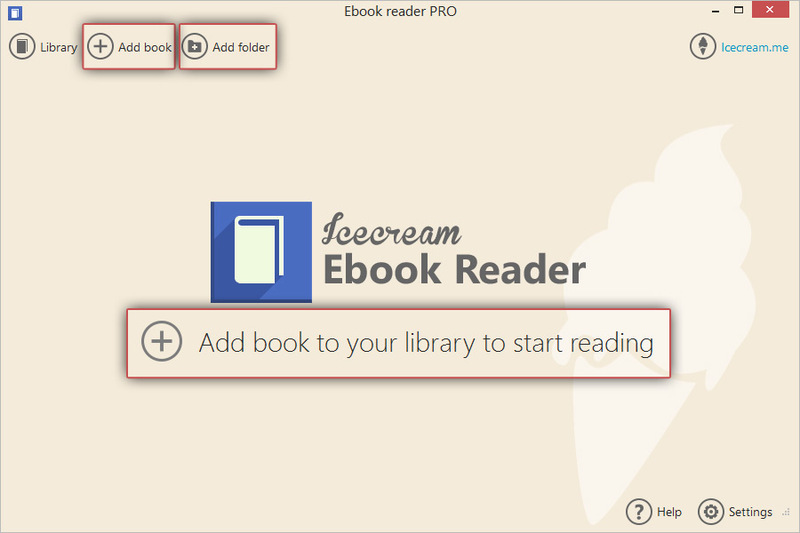 Icecream Ebook Reader is a decent EPUB reader which helps you open and read ebooks in EPUB format on your PC and thus enjoy the best masterpieces of world’s literature without spending money on paper books. Read on to get a better idea of how it works and learn how to open EPUB files using this program. First and foremost, download the program and save the installation file on your computer. After running this file, you will be suggested to install it. Follow the Wizard to complete the process (it doesn’t take longer than a minute) and launch the application to open EPUB files on your PC. 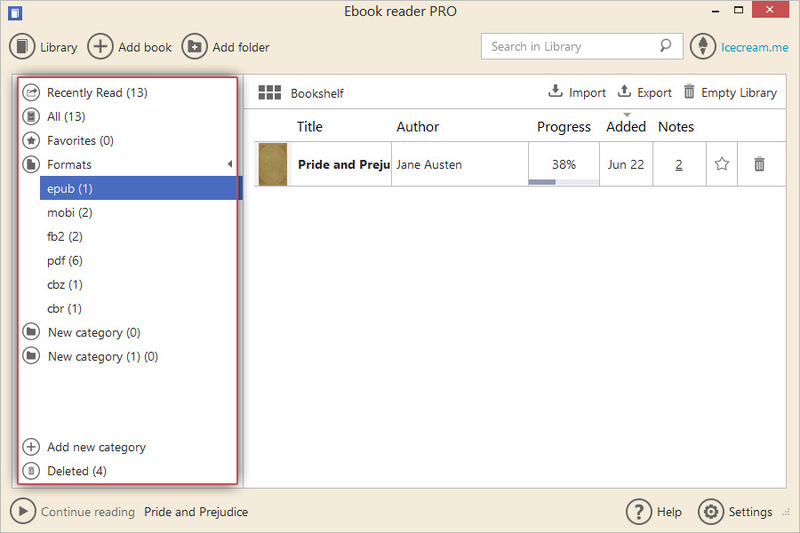 Click the “Add book to your library to start reading” button under the program’s logo in the center of the program's main window. Alternatively, press the "Add book" button in the upper left corner of the main window. Windows Explorer will be opened, and you can browse your hard drive to find previously downloaded books. The “Add folder” button lets you add the folders with the books to the Library through the Windows Explorer. The ePub reader also supports addition of the books and the folders to the Library by dropping them into the program's window. You can access all the added books by clicking the “Library” button in the most left upper corner of the main window of Icecream Ebook Reader. All the books can be displayed in a form of a table or a book shelf – click the icon in the upper side of the program's working area to select a desired view (Table view or Bookshelf). In the table you can find such books data as title, author, reading progress, information about when the book was added to the Library and information about the number or added notes and highlights. Along with that it's possible to add a book to Favorites (star icon) and delete a book (recycle bin icon). Menu at the left side of the window helps you check your recently read books (Recently Read), all the books in the Library (All), the favorites (Favorites) and view the books sorted by the available formats (EPUB, MOBI, FB2, PDF, CBZ, CBR). If you already added categories, they appear right below the list of the formats. In the lower side there's an “Add new category” button that creates new custom users' categories that can be renamed or deleted if needed. The “Deleted” folder contains the books that were previously deleted from the Library. You can restore all the deleted books from this folder back to the Library or do that with specific books or delete all the books from the folder at once or one by one. Press the “Settings” button in the bottom right corner of the main window to check the available settings and options of the Settings panel of Icecream Ebook Reader. The panel has 2 tabs – System and Profiles. You can familiarize yourself with the settings in this article. Now, when all the files are added and the right settings are configured, you can open EPUB files and read them with Icecream Ebook Reader. All you need to do is double click a book’s title or thumbnail (the mechanism is the same for both Table view and Bookshelf Library view modes). 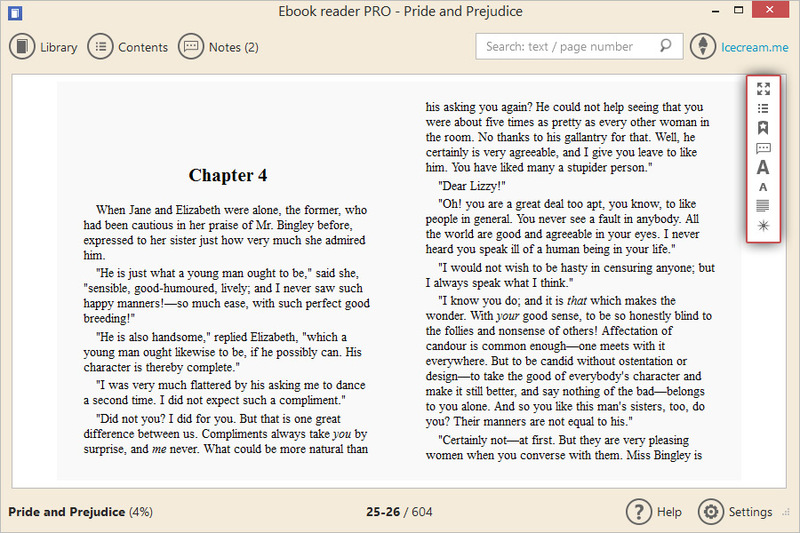 EPUB reader will open the book in the reading mode (you can expand it by clicking on the uppermost icon in the control panel on the right or by pressing the F11 keyboard button). Click on the right or left sides of the book's pages to switch to previous or next page (direction keys and “Backspace” and “Space” keys on the keyboard work exactly the same) or just scroll down to read more. You can also turn to navigation scrollbar in the bottom of the book to scroll through the book's pages. The control panel on the right side of the reading mode features several useful instruments for comfortable reading. Aside from the above-mentioned full screen mode, you can utilize tools like the table of contents (opens the book's table of contents and bookmarks panels), bookmarking (adds bookmark of the currently opened page), notes panel (opens the notes panel of the book), font size tools (increases and decreases the ePub's font), page view (changes the layout from double paged to a single one and back), and profile (switched between the three available profiles). Adjust the settings according to your preferences and read your books in the most convenient way possible.